Thriller may have sold as many as 110 million copies worldwide. 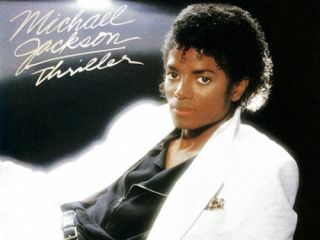 Michael Jackson's Thriller is (and is likely to remain) the biggest-selling album of all time. Released in 1982, it spawned seven singles and won eight Grammy Awards, selling around a million copies a week at the height of its popularity. One of the key players in the album's creation was recording engineer Bruce Swedien, and he recently told Future Music the story behind the making of Thriller, giving them a track-by-track guide in the process. It transpires that, even with all the talent involved, Bruce never thought that Thriller would go on to be so successful. "I think anyone who would have the balls to say that is a liar because you don't really know until it gets out in the public and they say 'wow this is really good'," he admits. "All we did was follow Quincy Jones down the path to the greatest music we could possibly make and with a passion for details. Quincy is such a remarkable man to work with - and Michael too. I mean we had a ball. "Michael was never late for a session - if anything he would be early. Also, I never remember recording Michael with the lyrics in front of him. He would stay up the night before memorising the song or songs we were about to record. I don't think there are a lot of artists who do that." Speaking to Bruce, it seems like the album almost flowed out of the studio: "With Michael, there weren't any difficult tracks to mix. Working with Michael and Quincy is easy as pie. They are so musical - and the passion for quality that we share has made working on these projects - especially Thriller - very easy." Thriller was recorded at Westlake Audio in LA, where Bruce had previously worked. "I love that studio - it's just fantastic," he says. "The room you record in is just as important as the mics. When I record somewhere, I have a collection of 105 microphones - every microphone in there I bought new and no one else has ever used it. That protects my sonic integrity. I got used to that incredible sound. One thing with Westlake Audio was that they knew the value of maintaining the gear." "That track is about Michael's brothers' wives and how they were always creating trouble - that was his inspiration. It starts with a lot of percussion. There's some drum machines and some live drums and other things. It's a Univox drum machine. We actually used it a lot on the Brothers Johnson record, and we were using it at that time on Michael's record as well. I think it's an SR55. I still have my own and it still works. "We DI'd every drum machine to get away from secondary pick-up and reflected sound inside the room. Also, a lot of these drum machines have a lot of low end. Like Roland with the 808; it has bottom end like you wouldn't believe and if you put that through a speaker it's all gone. So direct with a module and everything - boy it was killer. "I tried a bunch of new things in recording the drums on Michael's record - I had a kick drum cover made. I used to take the front head of the kick drum off and place a couple of real heavy cinder blocks inside to hold it still and weight it. Then, I'd put this cover on and the mic goes inside through a zipper opening in the cover, then you zip it up tight and turn it on and the rest is history." "That's John Robinson playing drums on my drum platform. I still use it and Michael did all his vocals on that drum platform. It's unpainted, unvarnished, about eight feet square and by getting the sound source up off the floor, it prevented secondary pick-up if I was recording other instruments along with whatever was on the drum platform. "We of course had incredible keyboard players too. We never hired anybody who couldn't play. "We used the same mic and pre throughout the album - I used my Shure SM7, serial number 232, which is very early. They've made so many SM7's that they don't even put serial numbers on them any more. I've been pretty vocal about how much I love that microphone, it's a great mic. It's dynamic of course and it worked just flawlessly with Michael - if you notice you can hear all the lyrics very clearly. "The mic pre we used was a Neve 1084 - I've got two of them in a gorgeous oak case and I used to carry them with me from session to session. Quincy said that working with me and moving my stuff from studio to studio was like working with the Fifth Army. You need to be that dedicated to the sonic of a project. You need to love what you do." "That was actually the first track we recorded for the album. It was a duet with Michael and Paul McCartney who was an absolute joy to work with. He was such a gentleman, he came to the studio prepared - Linda McCartney was with him and we had a fabulous time. "We had recorded The Girl Is Mine and it was already out there and released before we had finished the album. Quincy would come in every morning and put on a couple of local radio stations and they were all playing The Girl Is Mine, so that would make you very serious about your work very quickly. "Interestingly, we always recorded with Michael in the dark - he hated light. I mean I would have a little bit of light for him, but the studio was absolutely dark. I think one reason why he wanted this - and why it works so effectively - is that through my study of acoustics and so on, I found that the human being is primarily a visual animal, hearing is our second sense. People can be distracted by too much light in the studio to the extent that it can take away from the music." "When we did Thriller the song, the opening in particular, Rob Temperton - who wrote the track - had conceived it to have wolf howls in it. At the time there was a Sherlock Holmes movie, The Hound of The Baskervilles, that had this huge dog - a Great Dane - in it that did some howling and of course I had that in my mind's ear. "I automatically thought of my Great Dane who I figured ought to be in showbusiness! So I tried to get him to do those howls and you know what? He never did it. We put him up in the barn at night to listen to the coyotes and I had my tape machine ready to record him. He was a fantastic dog, 200lbs, his name was Max. I thought 'wouldn't this be great to have him doing those howls on the record' but he just never got it together! He didn't want to be in showbusiness. "But you know who it is that is doing those wolf howls? That's Michael Jackson, we had to get Michael to do it instead, but he did it so great. There's some library stuff in there but Michael did those wolf howls. "And of course we had Vincent Price in for the spoken-word part. He was great. There's a great story about Rod Temperton writing the lyrics for that part in the taxi on the way over to the studio! "For the creaking doors, I went to Universal Studios in Hollywood, the movie lot and rented two or three sound effects doors and brought them to Westlake and spent a whole day auditioning these doors and miked the hinges real close. That is a real door and I recorded that and added it on the track. Come to think of it, that might have been Michael doing those footsteps too actually." "Oh boy - the intro synth was a stock Synclavier patch, any Synclavier will make that sound. We liked it but we wanted everything to be unrecognisable, unique, so we didn't want to use that sound, but Michael loved it and made us keep it. "The highlight for me was the guitar solo. That guitar solo is incredible - when Eddie [Van Halen] came in to play, he was in Studio B at Westlake and I was in Studio A with Michael and Quincy but I went in there when he was tuning and warming up and I left immediately. It was so loud, I would never subject my hearing to that kind of volume level! I didn't record that solo, I hired his engineer - I figured his hearing would probably be a little suspect right now anyway. I then did the mix after it was recorded. "In terms of miking amps, I usually did either XY or occasionally Blumlein pair and I still do it the same. I think it was a [Neumann] U67 used on the amp for Beat It. "This track was really personal - Michael was at his home in Havenhurst and some girl snuck over the wall. She was lounging about the swimming pool - of course the security guards came and threw her out but eventually she sued Michael for being the father of one of her twins. It was pretty ridiculous. "The bass on this was fantastic - the bass player is Louis Johnson from the Johnson Brothers and I picked him up with a DI, which I still have - it's got a UTC transformer in it and I got it when I lived in Chicago and the low-end is incredible - very warm. "The drums on this track are great - I had a wall of gobos set around the drums which helped the separation quite a bit. I had an SM57 on the snare, RCA 77DX on the hat, [Neumann] U67 on each of the toms and I used a Sennheiser on the kick drum - I can't remember exactly which one. And then a pair of U67s for the overheads and that sounded pretty clean. "The thing that stands out for me is that I recorded the whole rhythm section on Thriller onto a 16-track tape deck and not 24-track. I had been using 24-track at the time, but the noise floor was so high that it made it a bit difficult so I worked in 16-track with no noise reduction to get what I wanted. Straight into the machine without any noise reduction at all, the result is hard to beat! I even went so far as to have my pal George Massenburg's absolutely spectacular-sounding 12-input portable console brought over to record the rhythm section. "The main reverb we used was the EMT 250. I still have one and use it on all my projects. I also have an EMT 252 with the 250 software in it which is a superb sounding reverb and I also use a couple of Lexicons. "For the strings on Billie Jean I was aiming for a real classical sound - not a pop sound at all. When I started my work in Chicago a few years earlier I had recorded the symphony orchestra so I know what a great orchestral recording can sound like. I don't think there are any basses on those strings but it was violin, viola and cellos and it was absolutely classical in the approach." "That was a track written by Steve Porcaro of Toto [with John Bettis]. He played and programmed a lot of the synths. It's a really incredible piece of music; it's so different, and Michael sings it so well. I don't remember what synths were used on it but it was real easy to mix that track because it's so well conceived. He's a phenomenal musician." "P.Y.T. was written by James Ingram and Quincy Jones - a great stone R&B hit. We used a lot of Minimoog - our synth programmer who was there all the time was Michael Boddicker. He programmed the Minimoog and he owned the best-sounding synths at the time. There was variation on every analogue synth and he kept his very well maintained. We used to call him Lily actually - Lily Tomlin was a big star at the time and she played a character where she was a switchboard operator with patch chords around her neck. Michael Boddicker used to walk around the studio with patch chords around his neck so Quincy started calling him Lily. "And he was a big part of P.Y.T. - he is programmer deluxe. The vocoder was a bit different for a pop record but we never wondered if it was the right thing to use. When you're working with the talent and stature of Michael Jackson and with Quincy Jones in the room, those questions never get asked." "Rod Temperton wrote that. Rod is very different from anyone else I've ever known in the music business - he's the most disciplined pop music composer I've ever met. When he comes to the studio, every musical detail is written down or accounted for in Rod's mind. He never stops until he feels confident that the music we're working on is able to stand on its own. "Rod and Quincy are two of the real giants in the industry. I'll never forget the time Rod asked me to check out a band called Heatwave, from the UK. Rod was working with them and he had such an American approach to his sound and music but he's from Grimsby. He has an intrinsic appreciation of urban values in popular music - I mean the real ghetto stuff. There were some young guys writing songs for Michael and they had never met Rod and they heard his music and they thought he was cool. But when they met him they said 'Rod, I thought you were young and black! But you're old! And white! …And British! '".